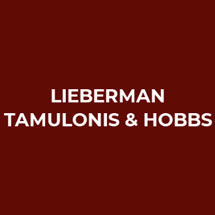 Lieberman, Tamulonis & Hobbs is a Pennsylvania law firm whose attorneys believe in the "old-fashioned" values of personal service, quality legal representation and civility. We represent our clients honestly and effectively, and we seek to keep them as long-term clients. We assist individuals in Pottsville, Reading, Harrisburg, Allentown, Stroudsburg and surrounding areas, in a variety of personal injury cases. We seek to win compensation for those who have been injured while using defective products, individuals harmed in dog bite accidents and those who have been involved in motor vehicle accidents. We also handle workers' compensation cases. To speak with a lawyer about your legal matter, contact us at 570-622-1988. John B. Lieberman III and Frank Tamulonis Jr. are the senior partners at the firm. Both attorneys earned their juris doctor degrees from the Villanova University School of Law in Villanova, Pennsylvania. They are joined by Eric M. Lieberman, who earned his J.D. from the Widener University School of Law in Harrisburg, Pennsylvania. Our community involvement and participation in a wide variety of professional associations has allowed us to develop long-standing relationships with our community and among our peers. Our commitment to ethical standards and principled conduct has led to our firm receiving an AV*-rating from Martindale-Hubbell, its highest rating. We are often referred cases by colleagues who respect the level of service and talent we provide. ZLTH Law was originally founded as a personal injury defense law firm, but in the past few years we have changed our focus, and now handle mostly cases involving accident victims. Our history on the defense side of the table has given us invaluable experience that allows us to provide our clients with comprehensive, multifaceted representation. Our ability to view matters from both sides of the table allows us to prepare and develop strong cases and anticipate the strategies used by the defense counsel. We make every effort to meet and exceed our clients' expectations.